Metal gears for masculine pages, cards, gift books, and tags! And they make great charms, too! 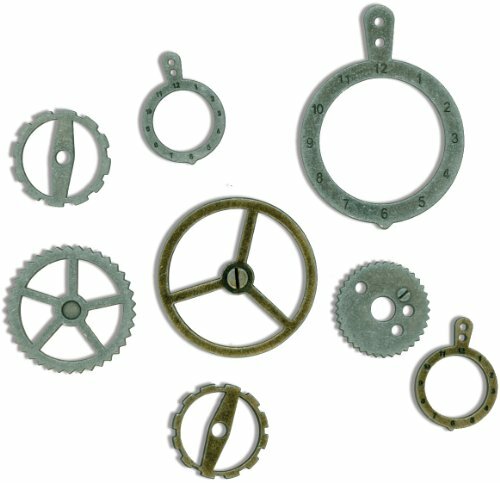 From Tim Holtz and Idea-ology, you'll get 14 metal gears (2 each of 7 styles) , 1/2"-1 3/4"wide. They also look great with the Game Spinners (link) and Salvage Stickers (link ). Attach them to pages to illustrate boating photos, on handyman cards and ATCs, or just for nostalgic and rustic charm. Use the Jump Rings (link) to attach them to chains, ribbons, cording or twine. 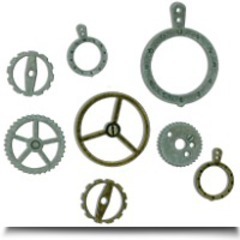 They can be added with brads or glued directly to your project. Dimensions: Height: 5" Length: 0.25" Width: 3"
Package Dim. : Height: 0.1" Length: 4" Width: 2.7"